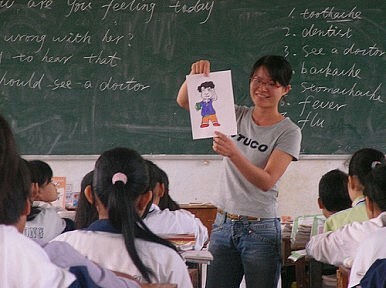 The English-learning industry in China is big business. But are schools really helping Chinese learn? The Economist has reported that Disney has entered China’s English-learning market. This seems like a sure-fire way for Disney to leverage its brand because learning English is a national obsession and a lucrative industry in China. It’s China’s de facto second language, and a prerequisite for getting into the right schools and the right companies. How to learn English is, literally, the billion-dollar question right now in China. But as someone who’s taught English on and off for the past 12 years to Chinese students I know that they have a love-hate relationship with the language: they know how important it is to learn, but no one’s figured out how they can learn it effectively, making Chinese too often feel frustrated and impotent. In the public school system, students study mainly grammar to learn one of the world’s most ungrammatical languages (to learn English via grammar is like Van Gogh trying to paint with a ruler). Everyone knows this, but no one can do anything about it because grammar can be tested, and to even attempt to test real English ability would be to discriminate heavily in favour of China’s already too-heavily favoured coastal cities, which can invest in small classes and foreign English teachers. One of the major schools is literally an industry in itself, and only in China could a test preparation centre be the number one brand in the private education world. Unfortunately, students don’t go there to learn English (although English classes are offered), but how to do well on the myriad of examinations to get into English-speaking universities. Every student who even thinks of going abroad one day will pass through it, but its popularity both reveals and reinforces the dominant mentality among Chinese students: that English isn’t a language, but a series of tests. This mentality doesn’t help when Chinese actually have to use the language in an interview with a multinational in Beijing, to do some shopping in the United States, or even saying hello to a Westerner. This frustration and insecurity has partly fuelled the growth of that unique Chinese phenomenon called ‘Crazy English,’ whereby whole crowds gather to learn English by shouting it out. Its founder, Li Yang, believes it works because it builds confidence. But as the New Yorker’s Beijing correspondent Evan Osnos points out, there are also some that suggest it encourages nationalism and xenophobia. There are a couple of big schools that are popular with white collar Chinese that offer foreign teachers and small classes to improve a student’s oral English ability. I’ve had two of my high school students enrol in their programmes, and they do come back with exceptionally strong oral English. Unfortunately, their Chinglish (expressing English with Chinese grammar and thinking) is still intact, and they’ve picked up a lot of bad habits along the way. And then, finally, there’s that most expensive and ostensibly more assured way of learning English: going abroad. There are expatriates in Beijing who lived here for years who don’t speak a word of Chinese, but they didn’t come to Beijing for either the language or the culture. Chinese who go abroad for high school are better in that they can at least converse, although most still have difficulties reading and writing. So what could be the problem with learning abroad? The problem overseas is the most common refrain at home as well: there are too many Chinese. Chinese who are abroad tend to cluster together, and have limited interaction with the Western world, hindering their language learning. In fact, Canada, where I’m from, has even made Chinese its third language!